Michael Slotwinski is a professional freelance artist from Sarnia, Ontario, Canada. While proficient in many styles and mediums, Slotwinski is most comfortable drawing with graphite, charcoal, and ink; and primarily paints with oils. In a modern age of art dominated by photography, digital media, and deeply conceptual artwork, Slotwinski strives to find new ways to keep his more traditional styles from seeming redundant. He does so by utilizing unique mediums (as seen in his Highlighter Art series), setting extraordinary challenges (like his One Line Drawings), and creating illusions (in his Focus Art) to diversify his subject matter. What may appear as novel on the surface-level soon becomes revealing upon further investigation. His primarily most well-known artwork, Hockey’s Masked Men, is an international touring body of large-scale oil paintings depicting the evolution of hockey’s goalie mask artwork. It has been on display in various art galleries, OHL hockey arena’s, and special events with the NHL, NHL Alumni Association, and Scotia Bank. And, of course, you can always commission him to create portrait drawings, paintings, and original works of artwork for any occasion. 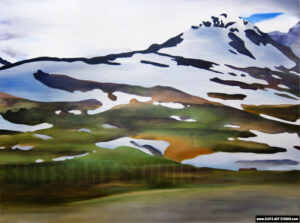 Click the IMAGE GALLERIES below to view more artwork.